The boys from Kanagawa High School are ready to take the next step as rugby players, and they’ll do it at their summer training camp. They’ll play several scrimmages against teams from across the country, all with their own various strengths and weaknesses. They even find themselves in a position to get their first victories, but it won’t be easy. Before they head for their training camp, though, there’s time to get to know some of the characters a little better. Coach is the first one to get the treatment, where some of his tough façade breaks down as he enjoys a meal with an old friend. It’s also revealed that he and his wife are unable to have children, which sets up for a touching and humorous moment later on when the team visits him at their home. It also explains what’s driving him to coach the kids after spending time away from the game. There’s also a deep dive into the life of Ise Natsuki, who has a complicated home life. 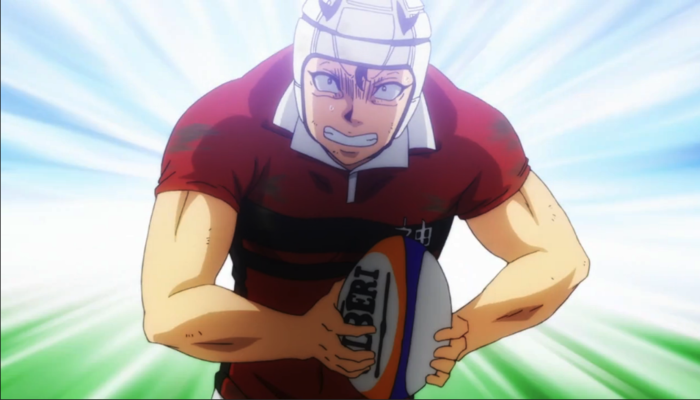 His desire to play rugby is causing him serious issues with his older brother and leads to some tough moments for him. Fortunately, one of his teammates knows what’s up and comes to help him out. It’s a situation that continues to build on one of the core themes of the anime, sticking together when it counts. Once the team finally makes it to training camp the focus returns to on the field action. Here, All Out!! slips a bit. It has served as a nice introduction to newbies of the sport by explaining how the game works. For the first time it started throwing out quite a bit of rugby terminology without a lot of visual aids. It’s a bit much and tough to wrap your head around. Fortunately, the visual aids do make a return. Not everyone on the team is excited about the upcoming season. One of them has serious doubts about their ability to reach their goals, and it shows up in the way he’s playing. When confronted, he comes clean about his thoughts. In sports there is the old saying “there’s always next year,” however it isn’t the case for this particular player. It was surprising to see this natural and realistic situation come up, and it added some spice. The ending wraps up the first season nicely with quite a few characters growing since episode 1. The boys learn a lot of lessons at the training camp, one of which is that they still have a long way to go. However, they definitely show the potential to have a special season. The overall video quality on this release is solid, though unspectacular. The bit rate hovers in the teens and occasionally spikes up to near 30. There is some color banding that shows up throughout, however it doesn’t remain on the screen for too long. It does a good job of getting across all of the visual qualities of the anime. This release comes with both English and Japanese language tracks. The English track is Dolby TrueHD 5.1, while the Japanese track is Dolby TrueHD 2.0. No complaints for either of these options, just go with whatever you feel comfortable with. Not much going on in this release terms of extras. There are the usual clean opening and ending sequences along with trailers for other Funimation properties. It would be cool to see more information regarding the sport or possibly interviews with rugby players. Although I’m not sure if Funimation feels it would be worth the cost to do so. 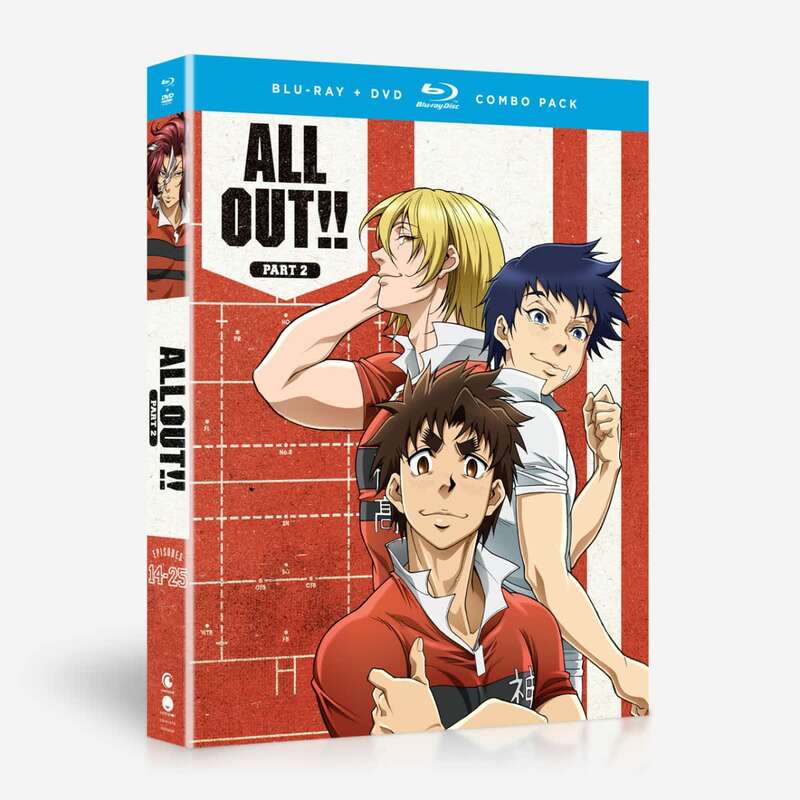 If you picked up part 1 of All Out!! and enjoyed it, then it’s definitely worth picking up part 2. It builds on what happened in part 1, has fun and interesting interactions between its characters, and stops at a nice point. It’ll be interesting if this anime goes beyond this point, however it’s still satisfying to watch up to where it stops with part 2.